Last month, two noteworthy events took place that, although primarily involving UK Muslim communities, may have consequences throughout the Islamic world. The first was a conference by The Deen Institute, with the provocative title ‘Have Muslims Misunderstood Evolution?’. This London event brought together a mix of European and North American scholars to discuss modern and traditional Muslim perspectives on the science of evolution and its place in Muslim theology. The second, a workshop called ‘Islam and Science: A Reasoned Approach’, was also held in London. This was a more selective gathering of young scientists from the United Kingdom, but also Egypt, France and North America, that was organised by the American University of Sharjah in the United Arab Emirates, the Interdisciplinary University of Paris, the online journal Muslim-Science.Com, and the Quilliam Foundation think-tank. The two events approached Islam and science differently, but they both responded to an onslaught of scientific discoveries — among them, further scientific evidence in support of evolution and against creationism, and cosmological discoveries explaining how the universe may have been created and, possibly, may come to an end. These have created the perception, if not the reality, of a crisis of confidence within the Islamic world as well as in conservative Western societies, particularly the United States. The kneejerk reaction from much of the Islamic world has been to deny these scientific findings or, worse, to discourage any debate about their significance to and impact on the Muslim faith. Nowhere is this conflict more dramatic than in the study of human evolution. In the United Kingdom, for instance, Muslim students — even those studying medicine and biology at university — have been reported as walking out of classes teaching evolution. The picture is similar in Canada , continental Europe and the United States. A study of attitudes towards evolution in Muslim majority societies by Salman Hameed, director of the Center for the Study of Science in Muslim Societies at Hampshire College, United States, found a considerable shift in public opinion towards evolution. Such results clearly have serious implications for attitudes towards science within Islamic societies, as one cannot reasonably accept most scientific knowledge yet selectively reject others. Also, the outright refusal to study science does not bode well for the development of the science-driven knowledge economies that many Muslim countries desperately seek to create. The Islam and Science workshop in London presented a possible way forward for Muslim societies by reconciling articles of Muslim faith with modern scientific findings. “[The] Quran, the Muslim holy book, deals with the reasons — why — of creation rather than the mechanism — how — and it continually implores the faithful to observe, collect evidence and reflect upon the creation,” says Nidhal Guessoum, physics professor at the American University of Sharjah and author of the book Islam’s Quantum Question: Reconciling Muslim Tradition and Modern Science. “The how of creation was firmly the domain of science”, he says, and this is where Muslim theology must defer to scientific evidence rather than invoking the verses of the Quran that are subject to interpretation and whose meanings evolve with the passage of time. There has been room within Muslim theological discussion and the works of Muslim polymaths of earlier centuries — many of whom were devout believers and made simultaneous contributions in science, philosophy, theology and law — for the acceptance of alternative views and differing interpretations. “Unfortunately,” says Usama Hasan, a senior researcher in Islamic studies at Quilliam and one of the workshop organisers, “the space for this important discourse has decreased rather than increased within Islamic societies over time”. Herein lies the key challenge for the Muslim world. What was refreshing about the two London events was that the impetus for the debates seemed to have come from within the Islamic world itself rather than having been forced or imposed from outside. Remarkably, the speakers and audiences did not feel the need to invoke outsiders to justify why this debate needed to be had and were comfortable having it on their terms with the goal of reconciling their personal beliefs with modern science. In doing so, they demonstrated a degree of maturity and confidence that such a debate can be had on a civil forum within one of the most conservative Muslim communities in the West. However, a lot needs to happen before science and religion, a science of the soul and mind according to Muslim faith, can take their rightful places within the broader Islamic world. Creating a culture of critical inquiry and discourse is key to that aspiration, as is freedom of expression and thought. Without these, the Muslim world will not see the flowering of science despite considerable interest and investment in it. By Athar Osama, published in SciDev.Net, February 15th 2013. 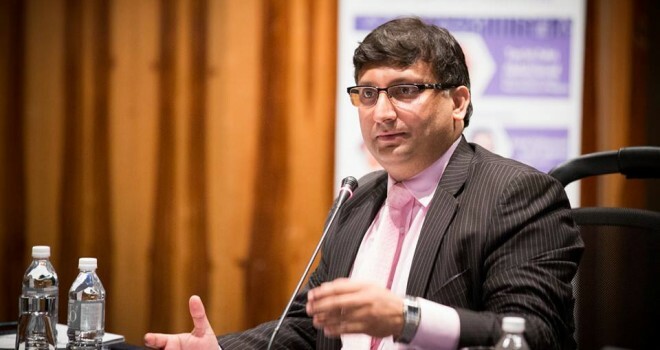 Athar Osama is the founder and CEO of Technomics International, a UK-based technology policy consulting firm. He is also the founder of Muslim-Science.Com and the Pakistan Innovation Foundation. This article has been produced by SciDev.Net’s Middle East and North Africa desk.